Computer scientist Torsten Hoefler is the winner of this year’s Latsis Prize awarded by ETH Zurich. His Scalable Parallel Computing Laboratory is one of the few laboratories to combine theory and application in the field of high-performance computing. Although mentors warned him against uniting these two aspects, it is precisely by doing so that he has now achieved his success. As a child, Torsten Hoefler, Assistant Professor at ETH Zurich, was fascinated by numbers. He would memorise as many car registration numbers as possible and attempt to somehow quantify the world on a daily basis. He would count the distance to school in steps and try to optimise this number. And today, Hoefler still organises his everyday life using mathematical models. The computer scientist even admits to having a performance model for his life. “I’ve definitely taken a bit of a mathematical view of life, but then my job is derived from my life,” he says. 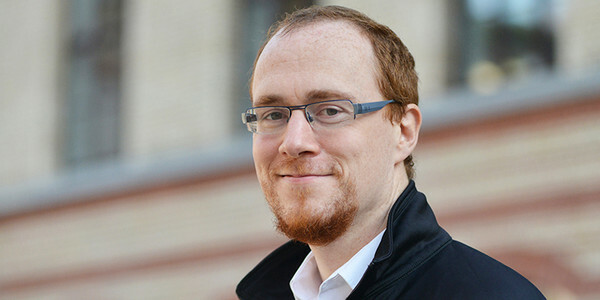 Hoefler’s has been a brief but remarkable career so far, taking him from TU Chemnitz, where he completed his Master’s degree, to a doctorate at Indiana University and a position as Adjunct Assistant Professor at the University of Illinois, and finally to ETH Zurich. At ETH, he is currently leading the Scalable Parallel Computing Lab at the Institute of Computer Systems. The laboratory’s name alludes to his research: his team focuses on improving the efficiency of computers in performing arithmetic instructions, which is nowadays synonymous with parallel computing. In parallel computing, work is distributed across a large number of computing cores (processors) so that many arithmetic operations can be performed simultaneously. The scientists in Hoefler’s group aim to find out how high-performance computing applications can be run efficiently on highly parallel systems with several million computing cores. The computer scientist and his team develop mathematical models and apply them to the optimization of high-performance computing software. Hoefler mentions that it is uncommon for a laboratory in this field to tackle both theory and implementation. “It’s a lot of work, but it’s rewarding to be able to put the theory into practice. ”With the Platform for Advanced Scientific Computing (PASC) and the supercomputer infrastructure of the Swiss National Supercomputing Centre, the practical side is really surging forwards, stresses Hoefler. In the context of PASC, Hoefler and his team are focussing on the compiler. The compiler has the job of taking scientific programs written in a human-readable programming language and translating them into efficient computer language. Based on an existing and commonly-used compiler, Hoefler wants to develop a so-called heterogeneous compiler that translates and optimises applications for various computer architectures. If this works, it would offer data centre operators and their users more flexibility in their choice of supercomputer architecture. For Hoefler, research means being precise and having understood a topic so profoundly and comprehensively that you are considered the world’s leading expert on it. And that’s how he approaches his subject area. Although he already has a long list of awards and accolades, the Latsis Prize is a particularly great honour for him and serves as another significant landmark in his career. He is receiving the prize for his work in the field of performance modelling, as well as for the simulation and optimisation of highly scalable parallel computer programs. It’s not just that he’s mathematised his life, admits the 34-year-old computer scientist, but that research has genuinely become his life. At some point, he recalls stumbling across the quote “Learn from everyone, follow no one, work like hell”. He recognised himself in this, but also added “believe anything is possible” to the quote because, Hoefler says, this is the only way to remain open to new ideas. Whenever he is not researching, the former triathlete tries to run as often as possible because, like the Ancient Greeks, he is convinced that a healthy body is essential for a healthy mind. Running is both his hobby and his passion, and he dedicates every spare moment to it. Sometimes, Hoefler even discusses problems with students while he is running. It is important to him to pass on his approach, knowledge and experience to his students, so that they too will learn to state their opinions succinctly. “The great thing about science is the inspirational environment that surrounds you on a daily basis, where the main task is to develop your own mind and, at the same time, to help others,” says the ETH professor. Established by the Fondation Latsis Internationale, this prize is awarded annually by ETH Zurich to honour outstanding work by its younger researchers across all research disciplines. It will be awarded on ETH Day on 21 November 2015 by Rector Sarah Springman.